At the 2010 Reunion of the Whitehurst Late Crews, 19-21 September, Reno, Nevada, the attending veterans voted to install a memorial plaque at the Museum of the Pacific War in Fredericksburg, Texas. With the price being only $350 for the 5" x 7" plaque, no fund raising was necessary. 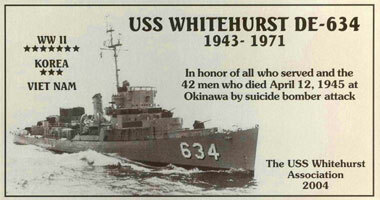 It was paid for from the USS Whitehurst Assn. treasury. The plaque, after design, with the able assistance of Marty Kaderli of the Nimitz Foundation, Kaderli@nimitzfoundation.org , was ordered in October and delivered in January, 2011. The photo used on this plaque was taken at Pearl Harbor, Hawaii, in June 1953, while Whitehurst was in Full Dress, in honor of the coronation of Queen Elizabeth II of Great Britain. The credit line below the bow of the ship reads, "Photo by: GM2 Glen Anderson". The photo of the plaque was made by U.S. Navy veteran and professional photographer Dudley Harris. dudleyharris@mindspring.com The 8.5" x 11" photo, suitable for framing, is available for $25 + s/h (at the time of this posting Jan. 2011). Larger sizes are also available. 2004 Plaque Installed at the Navy Memorial Washington D.C. Prior to the 2003 reunion in Peoria, IL of the 1950 and later crews of the USS Whitehurst DE-634, Roger Ekman Capt. USN Ret, suggested that we consider the Memorial Plaque program at the Navy Memorial in Washington, DC. Al Crawford QMCM USN (Ret. ), agreed to gather all the details and present the idea at the Reunion in October. After the details were presented, a proposal to raise the $2500 cost, by asking for donations from the post WWII crews, was unanimously approved. The sum of $850 was raised before the meeting was over. Al Crawford was appointed fund raiser. His request was mailed to everyone in the address list who served aboard Whitehurst after 1950. The response was immediate and positive. 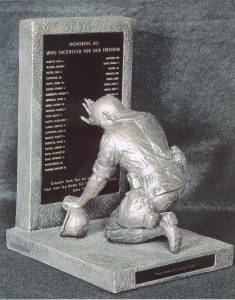 Enough was collected to pay for the Navy memorial plaque, an exact copy for reunion display ($125), all mailing expenses, with $1,325 left for a Navy related, non-profit project. In a business meeting at the 2004 reunion in Chattanooga, TN, the Whitehurst veterans voted to send the entire $1,325 to the USS Slater DE-766, now a museum ship in Albany, NY. In July, 2004, Treasurer, Arnold Pettijohn sent the check to the Slater Endowment Fund. The Whitehurst veterans listed below, contributed to the fund for the Memorial Plaque. We wish also to express our thanks to the many Whitehurst wives and companions who supported this effort. All share equally in the effort to honor those who died as result of engagement with the enemy in WWII and those who served later in Korea, Viet Nam and beyond. We who survive our departed shipmates do continue to Honor them. We also dedicate this plaque to our family members alive today and to those of future generations who will visit the Navy Memorial, and the Navy Log seeking to learn what part crews of the USS Whitehurst played in making this world a better place. Donors for the Plaque Installed at the Navy Memorial, Washington D.C.
Bobby Gentry Don Goldston David P. Graham Jr.
Carl E. Mullins Jack Nettles Harold A. Osgood Jr.
prepared by Dan Yeager who survived the attack.